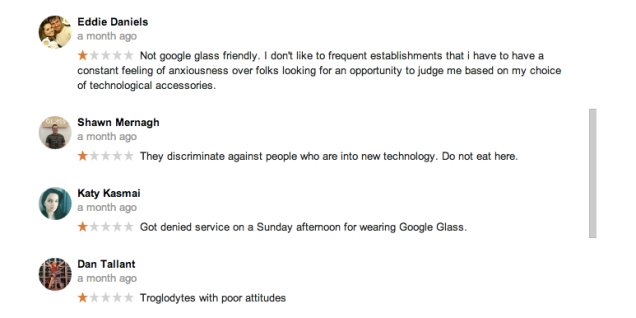 A woman wearing Google Glass was recently asked to remove the computer—infamous for publicized recordings taken by its entitled owners—before having brunch at a popular East Village restaurant called Feast. In retaliation, the diner and her 3,000 plus Google+ followers have extracted a search engine optimized pound of flesh. In the year or so since Feast opened, the restaurant earned high four-star ratings on both Yelp and OpenTable. But the neighborhood blog EV Grieve says the numbers dropped after Feast asked a walk-in customer named Katy Kasmai to remove the discomforting front-of-face apparatus late last month. A few months previously, [Feast] had another diner wearing a pair and the restaurant received several comments about privacy from other guests. Restaurant staff asked the person to remove them, and he quickly consented. 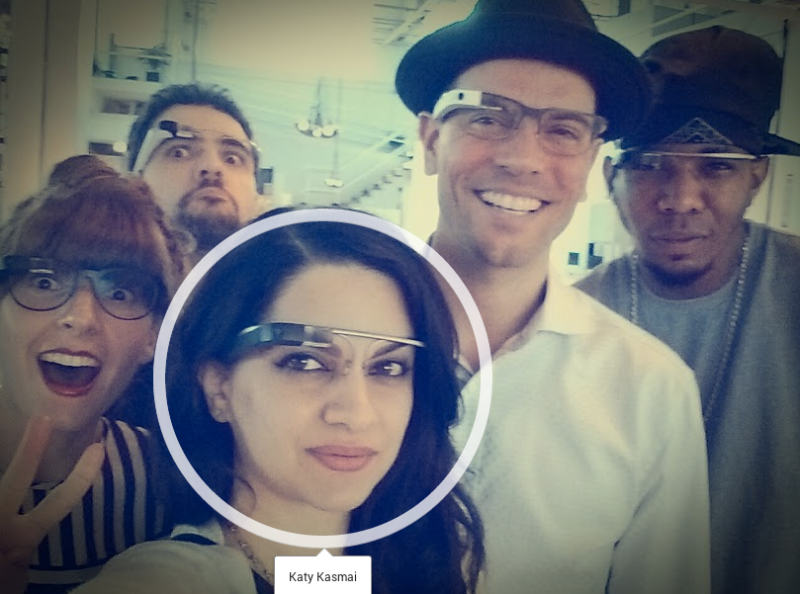 So when the other diner came in wearing Google Glass, management asked her to take them off before dining. She refused, and left the restaurant. Suddenly, last week, 13 one-star reviews showed up on the restaurant's Google profile, which, wouldn't ya know it, is the most prominent result when customers search for Feast on Google. Kasmai is both the founder of Glass NYC (a local community of Explorers™) and the CEO of Xocracy, a startup designed to facilitate "direct democracy" by voting on social and political issues "in real time." 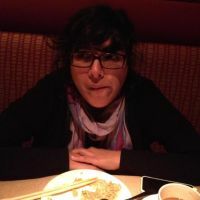 After being asked to remove her device, she put all that activist juju towards decimating the score of a seasonal American restaurant. 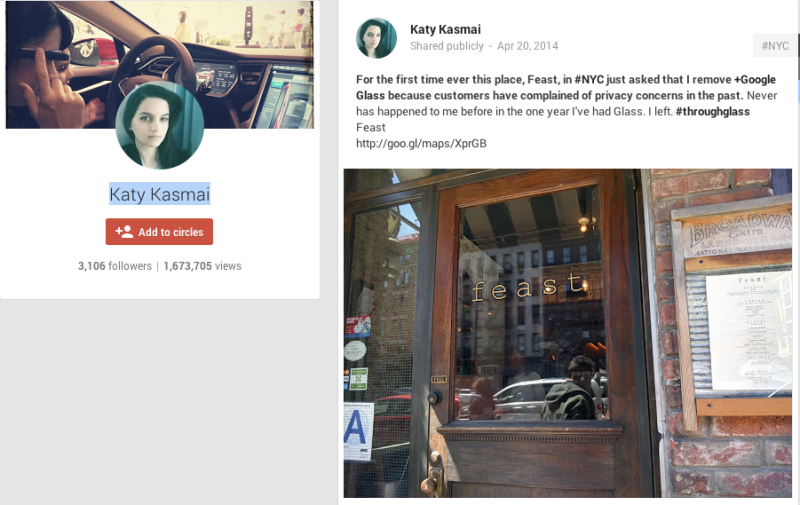 And then all 13 remaining Google+ users went to town! "When the first thing that comes up when you search Feast in Google is a 3.1, it can really hurt a restaurant like us. 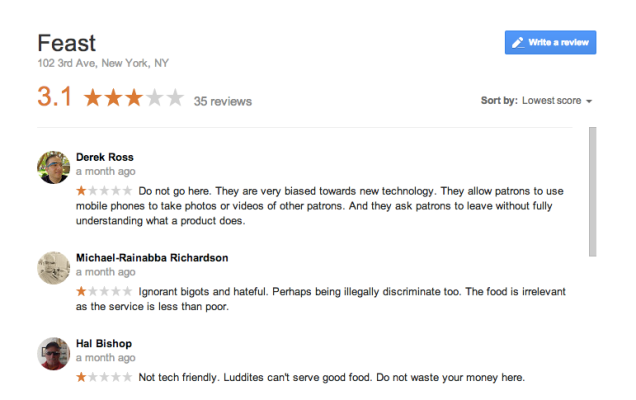 Then you have 13 people, which is about half the total reviews, who have never been to our restaurant let alone live in NYC, leave you one-star reviews … it's malicious and technically a violation of Google's own terms for leaving reviews," the Feast manager said. "Again I can understand her leaving the one-star based on her experience, but 12 others with no experience on who we are or what we do is unfair." "I don't like to frequent establishments that [sic] i have to have a constant feeling of anxiousness..."
That, my dear Android, is exactly the point. To contact the author of this post, please email nitasha@gawker.com.